Mid Michigan Community College hosted its 6th annual Rust Shaker mountain bike race on April 25, drawing a record 128 competitors. The race was held on MMCC’s Harrison campus’ nearly 16-mile mountain bike trail. Co-sponsored by the MMCC Foundation, Ray’s Bike Shop (Midland) and Terry’s Cycle (Alma), proceeds from the race benefitted MMCC student scholarships. MMCC’s bike and walking trails are open to the public. Bike riders of all skill levels can enjoy wooded and hilly trails, long and gentle climbs, as well as steep, rough terrain. 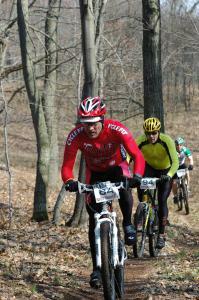 MMCC’s summer mountain bike race, the Sweat Shaker, will be held on June 27. This race is part of the Michigan Mountain Biking Association Championship Point Series. The college expects a large turnout of racers and tough competition as a result. To learn more about the mountain bike trails or races at MMCC, call Tiffani Lewis at (989) 386-6651. For more information or to register for the upcoming Sweat Shaker, visit www.midmich.edu/sweatshaker.